Standard Polyolefin Mailers, Standard Poly Mailers, Riverside Paper Co. These mailers are constructed from 2.5 mil poly and are puncture and tear resistant. You can over pack our poly mailers and they will not burst open as they have high strength seams to keep all intact. 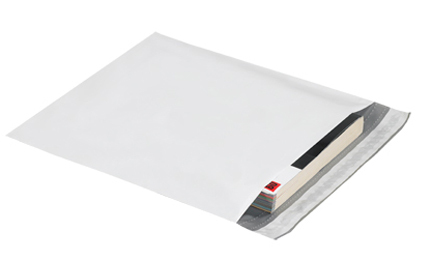 Poly envelope mailers have a white exterior surface and the inter lining is silver. Peel and seal closure. Light weight to save you on postage and shipping charges. 12 x 15-1/2" White Poly Mailer. Multi-layer construction won't tear or burst open . Water proof and lighter than paper to save on postage. High strength seam construction allows mailers to be overstuffed. Poly mailers have a write-on surface that accepts ink, pencil, pressure sensitive and water-activated labels.